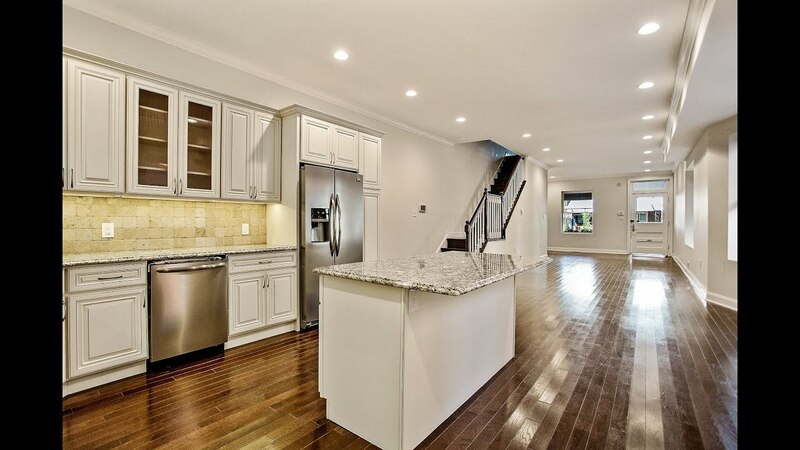 This stunning home has been completely renovated from top-to-bottom and boasts 5 spacious bedrooms, 3/1 luxurious bathrooms, a gourmet kitchen, brick-paved patio with raised planters and custom firepit, and over 2800+ sq ft of space for living and entertaining! Step up to a large front porch and into an open first floor plan featuring high ceilings with recessed lighting and hardwood flooring throughout, and a convenient first floor powder room. The kitchen offers oversized off-white cabinetry with plenty of room for storage, granite countertops and island, travertine backsplash, and shining stainless steel appliances. Upstairs you’ll find a master suite with generous closet space and en suite bathroom featuring a frameless glass stall shower, dual vanity, and soaking tub, along with a second bedroom and full bathroom. The third floor hosts three additional bedrooms, and another full bathroom with dual vanity and frameless glass shower surround. Outside offers a spacious backyard featuring a brick-paver patio, custom planters, and firepit. You’ll be only a few steps away from West Philly favorites like Dock Street Brewing, Hibiscus Cafe, and Cedar Park itself – the perfect place to call your own!